Deepa Kumar, one of the nation’s foremost scholars on Islamophobia, looks at how Muslims have become the predominant face of terror in U.S. news and entertainment media -- even though terror attacks by white extremists have far outnumbered attacks by Muslim Americans since 9/11. Arguing that racialized threats have long been used to induce moral panics and advance anti-democratic policies, Kumar explores how ruling elites have been raising the specter of Arab and Islamic terror since the 1970s to justify militarism, war, and curbs on civil liberties. From the Iran-Hostage Crisis in 1979 to the “war on terror” after 9/11 to the rise of ISIS today, she argues that Americans have been taught to fear Muslims out of all proportion to reality, presenting a wealth of eye-opening data about the actual threat level posed by Muslim terrorists in the United States. 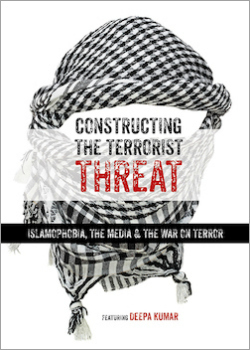 Constructing the Terrorist Threat offers a clear-headed assessment of terrorism that couldn’t be more timely and urgent given the politics of fear that now dominate our political landscape. Dr. Deepa Kumar is an award-winning scholar and activist. She is the recipient of the Dallas Smythe award for her engaged scholarship and the Georgina Smith award for her work on gender and race equity. Her work is driven by an active engagement with the key forces that define our era–neoliberalism and imperialism. Her first book, Outside the Box: Corporate Media, Globalization and the UPS Strike, is about the power of the U.S. working class in effectively challenging the priorities of neoliberalism. In her second book, she turns her attention to race and the politics of empire during the War on Terror era. Titled Islamophobia and the Politics of Empire, the book examines how a racialized terrorist threat has been produced. She takes a long view, tracing the ways in which the “Muslim enemy” has historically been mobilized to suit the goals of empire. She is currently working on a third book on the cultural politics of the US national security state from the Cold War to the War on Terror. In it, she pays heed to the ways in which gender, race, and class intersect in the reproduction of imperial structures. Kumar is an Associate Professor of Media Studies at Rutgers University. She is affiliated faculty with Middle Eastern Studies and graduate faculty in the Sociology department. She is a much sought after public speaker and has spoken at dozens of university and community forums on a range of topics: Islamophobia, Women, Empire and Islam, Imperialist Feminism, the War on Terror and other related topics. She has shared her expertise in numerous media outlets such as BBC, The New York Times, NPR, USA Today, Philadelphia Inquirer, Danish Broadcasting Corporation, Hurriyat Daily News (Turkey), Al Jazeera and other national and international news media outlets. "Deepa Kumar's calm, dispassionate, and fact-based assessment of how US media have exaggerated the Muslim threat and turned Muslims into the new face of terror comes at just the right time. This video is the perfect classroom tool for cutting through the wild speculation, baseless accusation, and unhinged fear of Islam that now rules so much of our political culture." - Lila Abu-Lughod | Joseph L. Buttenwieser Professor of Social Science at Columbia University | Author of Do Muslim Women Need Saving? "Deepa Kumar’s Constructing the Terrorist Threat begins with President Donald Trump’s “Muslim Ban,” and then proceeds to unpack all the complexities that lie within the loaded concept of “terrorism.” The film presents chilling evidence of the extensive damage caused by the bigoted idea that terrorists always “look like Muslims.” In her brilliant analysis, Kumar clearly describes the racism embedded within American Islamophobia while charting a path toward restoring democracy."